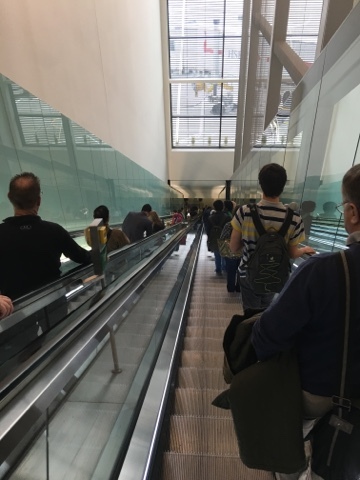 A long escalator ride and a 15-minute walk to Gate B 38 and our flight to Vienna on Austrian Airlines. After a pleasant 2 1/2 hour flight we landed at VIE, picked up our Vienna Passes, took the S7 to Praterstern, and transferred to the U2, and got off three stops later at Stadion, where there's a large stadium. From there it's a 5-7 minute walk to the hotel. We've trudged through light snow but today is perfect. 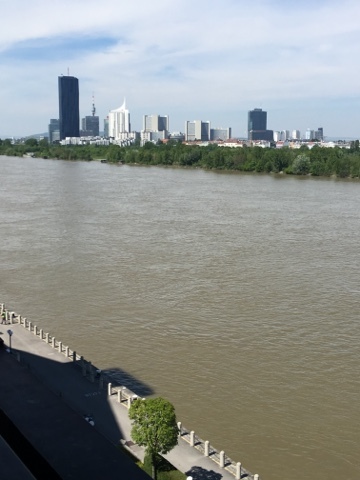 We were assigned a pleasant room on the 7th floor with a view of the Danube. Do I dare ask how many Hilton nights you have so far this year? A better question might be whether, by the end of this trip, you'll have spent more nights on the road than at home. We're guessing not as many as you have. We count "stays" rather than "nights" as that works out better for us, and so far we have 21 of the 30 stays required to renew Diamond status, a feat we're on schedule to achieve by September. You're 6 stays ahead of me. I don't expect to requalify as Diamond until November/December due to that pesky thing called a full-time job. We remember those days, but you do fairly well in the travel department, despite your work commitments.